Does your music collection have what it takes to create an unstoppable army? 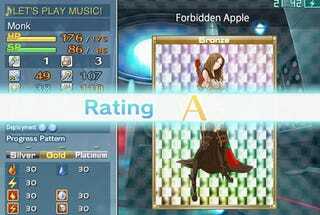 Find out with Song Summoner: The Unsung Heroes - Encore, the iPhone remake of Square Enix's original iPod game. Right before Apple launched games for the Apple iPhone on the App Store, Square Enix released the original Song Summoner: The Unsung Heroes, a strategy RPG for the original click-wheel iPod. The game used your own music to generate troops in battle, with power, class, and rarity determined by the song used in creation. You could even power up your characters when not playing, just by listening to the music that summoned them. It was a brilliant concept, but why wasn't it on the iPhone instead? Well now it is, and I can stop asking that question. Song Summoner follows the story of Ziggy, a young conductor with the power to give music physical form. His brother has been kidnapped, and he must rally the troops to fight by your side. The iPhone version of Song Summoner features more than 50 unlockable troops to aid you through a story twice the size of the original game, for more than 30 hours of gameplay. 30 hours of gameplay is a hell of a deal for the $9.99 asking price, and there's also a free lite version available if you want to try before you buy. I've spent the past hour going through the music on my iPhone, trying to create the perfect army. Apparently Weird Al isn't good battle music. Go figure.